An afternoon of politics, poems, laughs and song to mark the 30th anniversary of the 1986/87 Wapping Dispute. Presented by Sussex LRC with the support of Brighton, Hove & District Trades Council with all monies raised being donated to the News International Dispute Archive and the Campaign For Press and Broadcasting Freedom. Speakers & performers: Attila the Stockbroker, Paul King, Ben Chacko, Kate Smurthwaite, Mike Simons, Ivy Smith, Robb Johnson and Ann Field. Chairs: Claire Wadey and Andy Richards. View our photos of the event. Donations are still being collected for NIDA and CPBF. 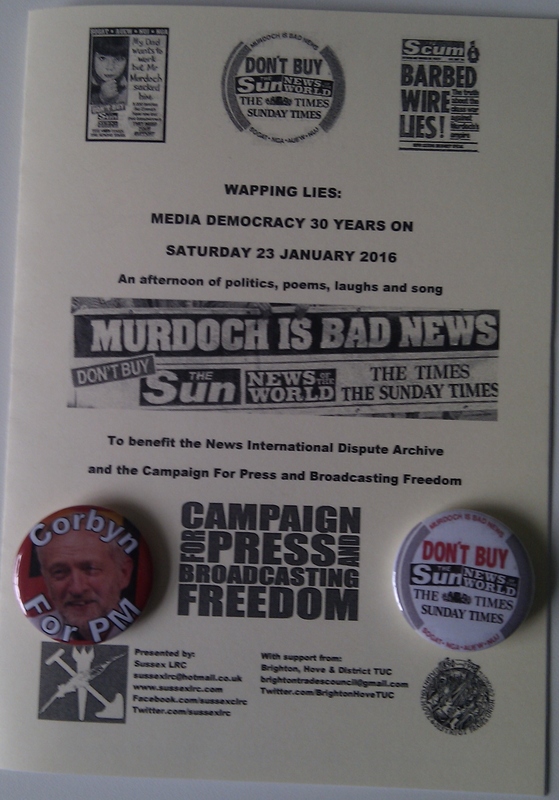 Contact us if you would like to buy one of our Wapping Lies programmes or reproduction Don’t Buy the Sun… badges, or any other Sussex LRC badge.